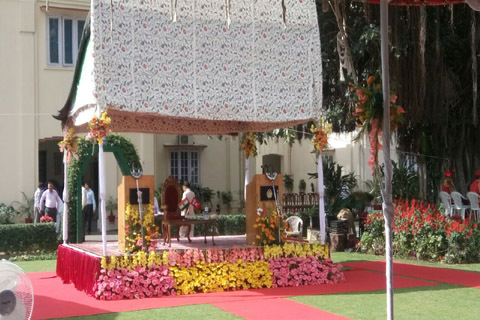 As Ms Mehbooba Mufti created history by becoming the first woman Chief Minister of Jammu and Kashmir on Monday, many interesting events unfolded on the stage where Governor N N Vohra administered oath of office and secrecy to Ms Mufti’s ministers. After MLA Hazratbal, Asiya Naqash, rose to take oath, her pronunciation of the oath text was corrected by Vohra himself. Choosing official language of J&K, Urdu, did not help her. She fumbled with words reading: ‘bil waasta instead of bila waasta’. Law and Parliamentary Minister in late Mufti Mohammad Sayeed led PDP-BJP government, and MLA Sangrama, Basharat Bukhari took oath in native Kashmiri language. He repeated his March Ist, 2015 day. The only difference was that he wore a Western Hat last time. Today, he was wearing Karakul. Making it to news every other day when he was in office as Health Minister, Lal Singh, took oath in Dogri.